After spending a few minutes jumping up and down in excitement, I think I've managed to compose myself enough to write this. Or perhaps not! As a woman, who is super fan of the Marvel's franchise, I've been waiting anxiously for a Marvel Studios' film portraying a female superhero as the main character. Don't get me wrong, I love all the previous movies of the franchise, and I do have my favorite male superheroes from the MCU, but I think this movie has been long overdue. I do believe that the female characters have as interesting stories of their origins, as the rest of our favorite male superheroes. That being said, this is what this film means to me. The cherry on top after a long series of films in the franchise, and I just can't wait for next Spring, when this film arrives to theaters. Cheers to Marvel Studios, and may this be the first of oh so many other films with powerful female lead roles. 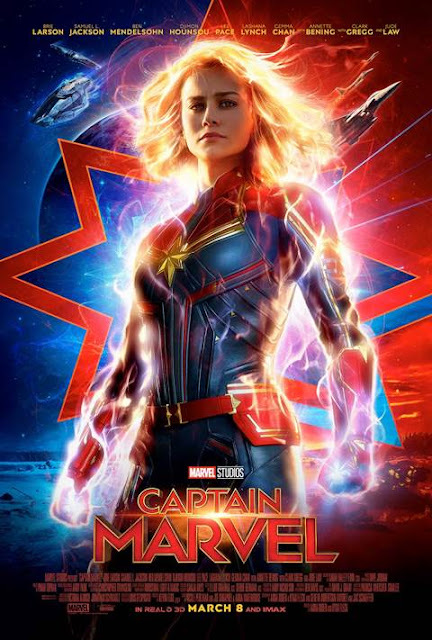 Now, without further adieu, I'm very excited to present to all of our followers, the newest trailer for Marvel Studios' Captain Marvel, which aired last night during halftime of ESPN’s “Monday Night Football” NFL's game between the Washington Redskins and the Philadelphia Eagles at the Lincoln Financial Field. So this is where I stop talking or rather writing, and invite you to play the trailer and join me in thrill, because four months go by rather fast. Please enjoy! playing in theaters across the U.S. So what do you think so far? Who in your family, do you think is most excited to watch this film? What other female superheroes from the Marvel Cinematic Universe would you like to see, starting their own film? Please let us know in a comment below. We'd love to read you. Don't forget to follow us on social media or via email subscription to keep up to date with the latest on Marvel Studios' Captain Marvel, and other amazing fun family films and events. Until next time, remember to smile, because it's contagious and that my friends, is a superpower too.